I didn’t realise this until now, but today marks my 6-Year-Blogiversary for KitchenOperas!!!! I shared it with my friends on Facebook with the words: “[Lindsay] finally started a food blog, so all her facebook friends don’t get hungry at work.” I like to think it’s turned into so much more. Here’s to a delicious next six years! But seriously guys, this one’s totally worth it. This is a grain-free, gluten-free, dairy-free banana bread, that will pass anyone’s taste test! 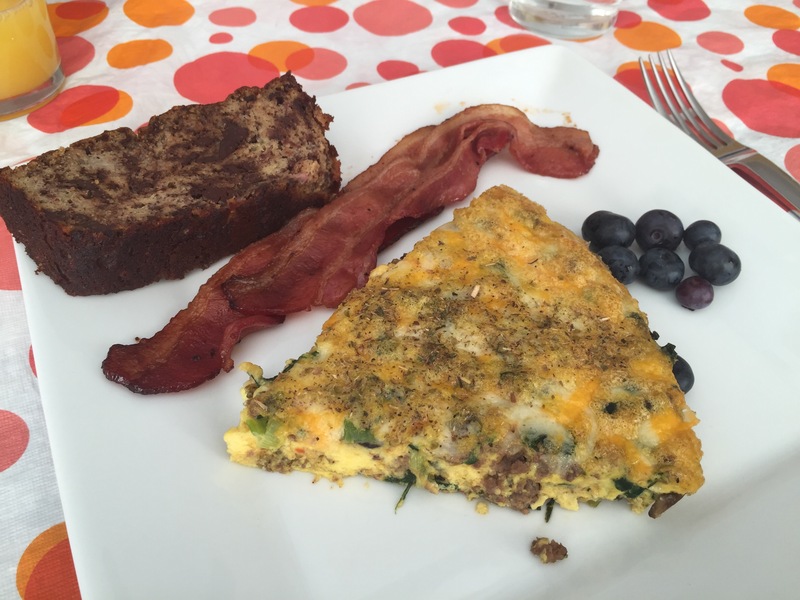 I took it to a family brunch today, and it was loved by kids and stalwart gluten-eaters alike! I was pleasantly surprised, as without gluten or added sugars (the only sweetness comes from the bananas! ), I thought this might be a perfect treat for gluten-free grown-ups, and that would be it. But it’s so moist and delicious, that everyone loved it! I’m hooked. My cousin asked if I wanted to bring any home, as I had taken the whole loaf over. I declined, as I knew that I’d be making another whole loaf this week to put in the freezer for whenever I needed a treat. I am totally in love. I made the banana bread the night before (to avoid a busy morning), let it cool, wrapped it up in aluminum foil, and left it out on the counter at room temperature. It was TOTALLY PERFECT at brunch the next morning. 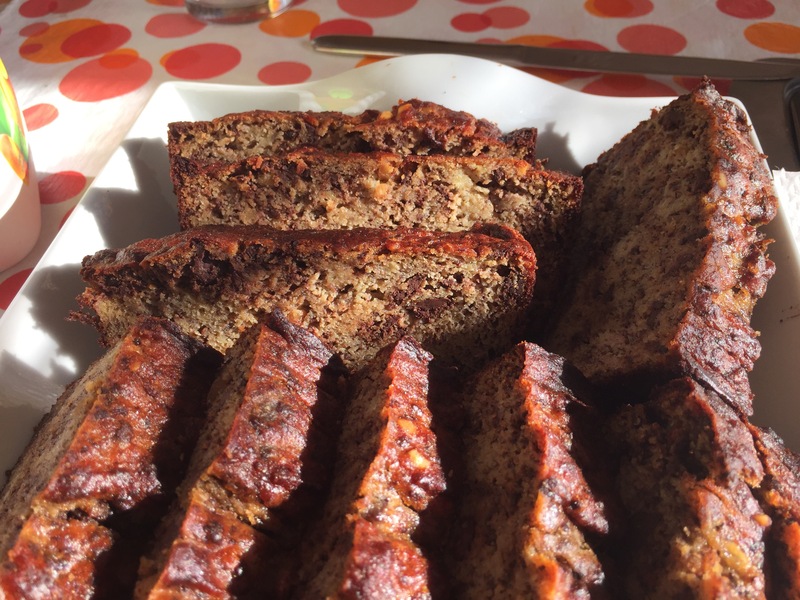 I completely recommend enjoying this banana bread along with homemade spinach cheese and ground beef frittata, crispy bacon, dancing 3 year-olds, and hoola hoops. If you can’t swing that, it’s pretty good on its own, too. Seriously. You need this banana bread. I took this to a family brunch, and everyone loved it. Even people who normally eat all the grains and dairy! This recipe is a total winner, and I’m going to make it a staple in my freezer so I can have it all the time. 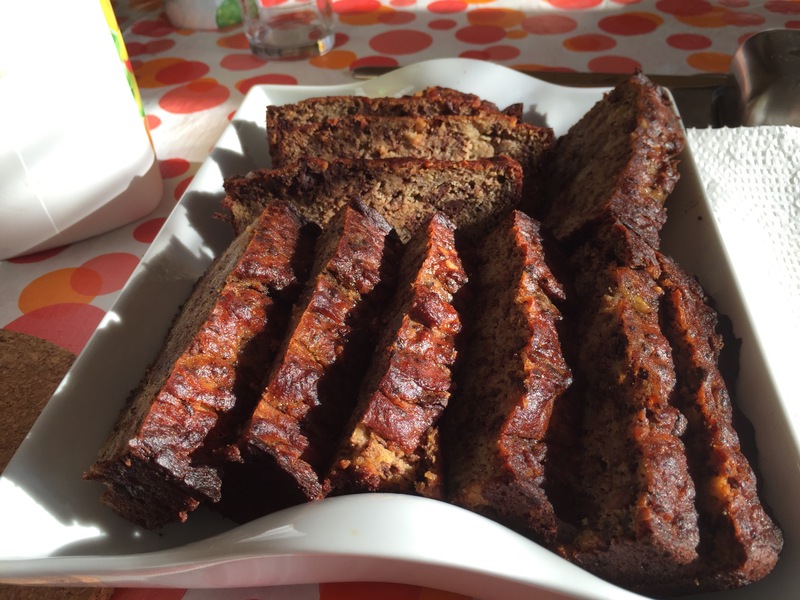 Inspired by Bakerita’s Paleo Chocolate Chunk Banana Bread, Makes 1 9×5″ loaf. Whisk together wet ingredients: mashed bananas, eggs, peanut butter, coconut oil, and vanilla. Add the dry ingredients (coconut flour, cinnamon, baking soda, baking powder, and salt), and stir well until all ingredients are incorporated. Add in the chunks of dark chocolate in stir until just combined. Pour into the prepared loaf pan, and even off the top surface with a spatula. Bake at 350F for 55-60 minutes, until a toothpick inserted into the middle comes out clean. I noticed mine came out clean after 40 minutes, but it needed the full 55 minutes to cook all the way through the centre. Let cool in the pan for 30 minutes, then remove to a wire rack and let cool completely. Eat and enjoy! The recipe looks delicious, but you had to put a picture with bacon in there and now I’m instantly very hungry! … and happy belated blogiversary! !